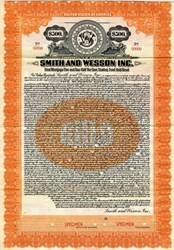 Beautiful specimen certificate from the Smith and Wesson. This historic document was printed by the American Bank Note Company and has an ornate border around it with a vignette of the company's logo and is over 90 years old. 50 coupons attached on side and on top. Smith & Wesson (S&W) is a manufacturer of firearms in the United States. The corporate headquarters is in Springfield, Massachusetts. Founded in 1852, Smith & Wesson's pistols and revolvers have become standard issue to police and armed forces throughout the world. They are also used by sport shooters and have been featured in numerous Hollywood movies, particularly Clint Eastwood's Dirty Harry. Smith & Wesson has been known for the many types of ammunition it has introduced over the years, and many cartridges bear the company's name.